Originally posted on May 25, 2014 on this blog. This passage begins with the first major issue: Who will do it now? Who will restore the Kingdom of Israel and restore God’s Kingdom? But there is an underlying clear assumption that what Jesus began his successors will continue. The assumption has nothing to do with duty or responsibility, but with sincere devotion to the truth that Jesus conveyed and the deepest desire for that truth to continue being spread throughout the world. This assumption plays heavily into the way that the Book of Acts is constructed. It has to do with the way the church and the people of the church pattern their lives after the life of Jesus Christ. The phrases “through the Holy Spirit” and “the apostles whom Jesus had chosen” introduce that continuity and also introduces a partnership, a community if you will, that is being formed. The Book of Acts begins with the assumption that the reader is already familiar with the Gospel of Christ and with Christ’s Passion, death, and Resurrection. The Resurrection of Jesus is a theme of enormous importance for this book. It testifies to Jesus’ faithfulness to God and confirms him as Lord and Christ. Acts simply says that Jesus “appeared” to his disciples over an extended period of “forty days”. There are differing opinions as to what these “forty days” represent. It may have been a way to fill out the calendar between Easter and the Ascension. In Old Testament writings, forty often refers to a period of preparation (such as forty years) during which God fully instructs people for their future work. Essentially, Jesus gathers his followers after Easter to prepare them for their future without him. His leaving is not abrupt; he has prepared them for his departure. What we are told here is that waiting for God to act is an individual’s project, but it is also a community project. Waiting with others is an act of solidarity. They were joined together in a specific place to await God’s action. But waiting on the Lord to act is not a passive activity. They waited by praying, studying together. Prayers are not offered to solicit God’s benefaction, which they have already experienced, nor to ensure that God would fulfill what is promised them. Praying demonstrates the importance of unity and the resolve in accomplishing that to which God calls us to accomplish. When we proclaim the Ascension as part of the Gospel, we are not, as Ronald Cole-Turner says in Feasting on the Word, saying that we believe that Jesus ended his earthly ministry with the equivalent of a rocket launch. It is, rather, a belief that Jesus Christ ascended to glory. It is inextricably linked with the Resurrection. As Jurgen Moltmann put it, “Jesus is risen into the coming Kingdom of God.” He is raised in power and in glory. 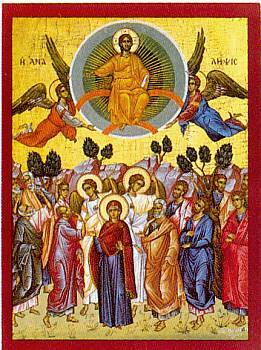 The Ascension is the gathering up of all who are in the Presence of God. Our lives are suddenly swept into something larger than anything we can possibly imagine. No longer is Jesus our personal teacher or our private tutor. This is the moment when we enter into the Risen and Living Christ. This is the moment that we begin to become. The Kingdom of God is at hand. And through faith, we, too, are made whole. The absence of the earthly Jesus leads us to search for a God who is present in the world. So, then, why do we, too, continue to stand here gazing up into the heavens? For what are we waiting? Jesus is gone. And yet, the whole world is filled with the Spirit that has been left behind. We are the ones called to do the work of Christ in the world. So why are you standing there gazing up, hoping that something will change. Just do it. Get busy. 2) What does it mean to speak of the “absence” of Jesus and the idea that that leads us to search for God? 3) Where do you find yourself in this story? This passage and the verses that precede it begin with sort of a thanksgiving prayer report. But lest we spend too much time breathing our collective sighs of relief and thanksgiving, the author (possibly, but not definitely Paul for most scholars) claims that all this would not be successful if the church does not become known to others as a place of faith and mutual love. This is sort of interesting—the letter begs the question as to how our churches become known for their faith in Jesus. Is it a matter of reputation or a matter of publicity? The phrase “with the eyes of your heart enlightened” describes the result of wisdom. During this time, baptism was typically described as “enlightenment”. In essence, it is a way of seeing God’s light through the darkness of the world. But the letter warns its readers not to return to that state of darkness. The concluding section of this passage is often recognized as the development of a creedal formula. The audience already knows that Christ serves to mediate God’s gracious blessings from heaven. Ephesians treats this exaltation of Jesus rather than the cross as the focus of God’s saving and redemptive power. Ephesians probably does this to drive home a more permanent victory in Christ. The whole Resurrection is a restatement of authority, a revisioning of power. It changes everything. 2) What does the idea of “the eyes of your heart” being enlightened mean for you? 3) What message do you think this holds not just for us as individuals but for our churches today? In this passage, the verb for “opened” is the same that was used in the Emmaus story when their eyes were “opened” and the Scriptures were “opened” to them. But the message of the Scriptures is, of course, not self-evident. Here, Jesus opens their minds to understand the Scriptures. Here, the proclamation of repentance and forgiveness of sins is opened to all—to all nations. The mission, then, will begin in Jerusalem and extend to all nations. Jerusalem has up until now been the center and focus of the Gospel. The Lukan Gospel is the only one that chronicles the departure of Jesus. The Ascension both closes the period of Jesus’ ministry and opens the period of the church’s mission. The final words of the Gospel lead us to an appropriate response to the gospel of the one who saves, sends, and blesses us. The disciples received Jesus’ blessing with great joy, they worshiped him and praised God, and they began immediately to do what he had instructed them to do. Here, then, is the completion of the Gospel drama, the narration of what God has done for us, the challenge of Jesus’ teachings, and the model of those who made a faithful and joyful response. It is our new beginning. It is our turn. Essentially, Jesus has given us the “footprints” in which to walk. It is not about legislation or rules or “what would Jesus do”; it is about incarnation, about becoming the embodiment of Christ. When I was about 13 or 14, my father asked me to ride along with him as he cultivated a field of corn. It was a tricky job. The sharp blades of the cultivator had to pass between the rows of corn. If we had veered a few inches to the left or to the right, we would have plowed out four rows of tender young corn plants. The John Deere Model 70 did not have power steering, so holding the tractor and cultivator in a straight path was not always easy. After a few rounds down the 20-acre field, my father asked me if I would like to try driving. Reluctantly, I sat down behind the steering wheel, popped the clutch, and took off down the field. Steering was harder than it looked. Forty feet of corn, in a four-row swath, were plowed out before I had driven five minutes. My father gently gave me a few suggestions as I went awkwardly—and destructively—down the field and back. After a few more rounds, my father asked me to stop the tractor. I thought he had endured all the pain he could. The carnage in the corn field was overwhelming. He would tell me to stop. I obviously was not controlling the tractor and cultivator. Instead, my father dropped to the ground and said he had some chores to do in the barn. I was to finish the field and then come in for lunch. All morning long, in my father’s absence, I plowed my way back and forth across the corn field. Huge sections of corn were torn out, roots exposed to the drying sun, and stalks prematurely sliced down. But by noon I learned to handled the tractor and the cultivator. My father’s absence was a sign to me that he trusted himself and what he taught me. It also signaled that he trusted me. His absence was empowering rather than disabling. It authorized me to trust myself and trust what he had taught me. I would never have learned to cultivate corn had I worked anxiously under his critical eye, hanging on his every gesture and comment. That is the meaning of Ascension and Pentecost. Jesus’ withdrawal becomes an empowering absence. It is a sign that he trusts what he has taught us enough to set us free. He refuses to allow us to depend upon him. We cannot cling to him but must learn to discover his authority among ourselves. Thus, he tells Mary not to cling to him but to return to the community of his disciples. (John 20:17). This sense of empowerment and authorization is exhilarating. It is like tongues of fire. We name that experience the Spirit of the Living God. 2) What does this “Holy Absence” mean for you? 3) Why is that difficult for us to grasp? Let me bathe in your words. Let me soak up your silence. Let me enter your quiet. Let me tell out your stories. Let me enclose them within me. Let me be the spaces between phrases where you make your home.